The bright polished 4500 line stainless accessories are fabricated from type 304 series stainless steel with a highly reflective polished stainless steel finish. The mounting system is concealed, with a rectangular flange snapping over the mounting bracket that is welded to the post to form an integral unit. These commercial-quality washroom accessories are ideal for hotel, hospital, office building, and other heavy-use requirements. S-4533-BS - Single hook- 4-1/4" proj. 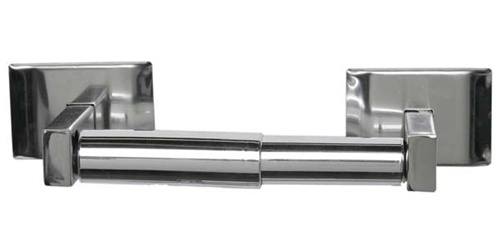 S-4542-18-BS - Round towel bar- 18"
S-4543-18-BS - Square towel bar- 18"
S-4542-24-BS - Round towel bar- 24"
S-4543-24-BS - Square towel bar- 24"
S-4542-30-BS -Round towel bar- 24"
S-4543-30-BS - Square towel bar- 30"
S-4542-36-BS - Round towel bar- 36"
S-4543-36-BS - Square towel bar- 36"
S-4573-18-BS - Utility shelf- 18"
Towel supply shelf- w/o bar-18"
S-4572-18-BS - Towel supply shelf- w/o bar-18"
S-4573-24-BS - Utility shelf- 24"
Towel supply shelf - w/o bar-24"
S-4572-24-BS - Towel supply shelf - w/o bar-24"
S-4574-18-BS - Towel supply shelf- w./ bar- 18"
S-4574-24-BS - Towel supply shelf- w./ bar- 24"
Towel supply shelf w. bar & brace-18"
S-4577-18-BS - Towel supply shelf w. bar & brace-18"
Towel supply shelf w. bar & brace-24"
S-4577-24-BS - Towel supply shelf w. bar & brace-24"